Lawmakers are considering the future of the State Historical Building which sits two blocks west of the State Capitol. Republican Representative Gary Mohr of Bettendorf said the building is in disrepair and the tab for renovating it is a staggering $30-to-$50 million. 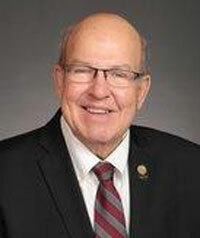 Mohr said no decisions have been made, but a bill pending in the legislature calls for assembling a group that would evaluate relocating the State Historical Building. One idea is to move it to the Iowa State Fairgrounds. “Perhaps more people would go through the State Historical Building during the 10 days of the State Fair than go through it all year round at the current location,” Mohr said. The building today sits in what’s become known as the “East Village” of Des Moines. It’s a bustling district between the Des Moines River and the State Capitol that features restaurants and bars, retail shops and new housing. Mohr said there’s been no evaluation yet of what the state might gain by selling the property. Thunderstorms have invaded the State Historical Building for years. One long-time Democratic lawmaker recalls there were buckets inside, catching water, during the building’s grand opening. Three years ago, museum officials touted an $80 million plan to upgrade the facility and protect the 200 million artifacts on display and in storage, but legislators balked at the price tag. Mohr said it’s time to quit kicking the can down the road and start making some long-term plans. A budget bill that cleared a House committee this evening sets aside a million dollars for a 10-member task force to begin considering what’s next for the State Historical Building.